Inviting family and friends to the UAE for a wedding doesn’t have to be a one-day event, why not host a string of events before and/or after the day. Your Day, Our Time is renowned for welcoming guests to the region and entertaining them in a number of ways e.g. yacht party, pamper evening, desert safaris and rehearsal dinners. These activities make the trip even more memorable for your guests. a. Desert Safari which incorporates traditional dancing, belly dancing, Arabic food, henna, dune bashing and quad biking out in the desert. b. Luxury Dhow Cruise Dinner, this is a traditional Arabic wooden boat which sets sail while you enjoy a nice dinner at sea. c. The typical Friday brunch (popular with Western holidaymakers and Expats alike). Guests pay a set amount to eat and drink for up to 4 hours (choices include soft drinks, house beverages or premium packages- champagne). d. Ladies Spa Day (Dubai and Abu Dhabi both boast some of the biggest day spas in the world). h. Luxury Car Experiences etc. 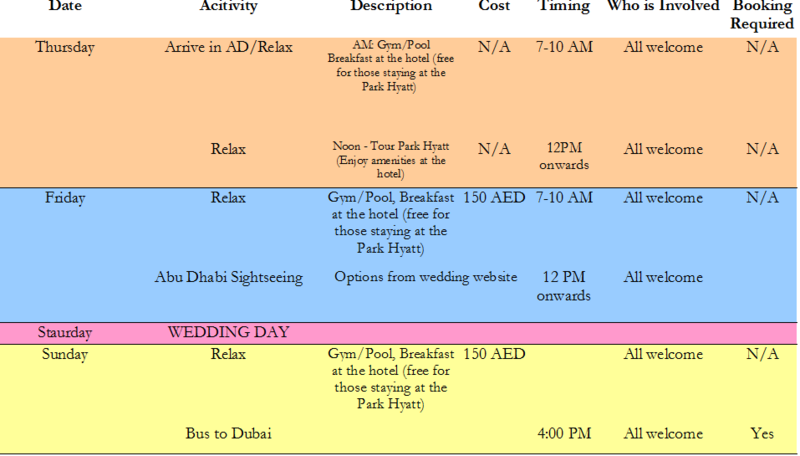 While in the UAE for your wedding it will probably be the first time for a number of your guests. Dubai and Abu Dhabi, in particular, can be expensive cities to have fun in, however, there are a number of ways your guests can enjoy what the UAE has to offer (without breaking the bank). There are two main websites Cobone and Groupon where residents and non-residents alike can access deals (desert safaris, yacht trips, dinners, massages) and save up to 75% on the normal retail price of these activities. Another option is the Entertainer book or app which can be bought at any supermarket, this offers buy one get one free vouchers for water parks, hotels, leisure activities, restaurants (casual and fine dining), nightspots….the list is endless. One final thing to think about. Your guests have arrived in The UAE, what better way to welcome them than to gift them with goody bags. Your Day, Our Time is able to personalise welcome totes for your guests, items to include in the bag are a welcome letter from the couple), maps and postcards of the city, any information relevant to the big day and quirky gifts e.g. DIY CD, sunglasses, flip flops etc. Contact us for more information on how to plan your Nigerian wedding in Dubai or Abu Dhabi. © 2016 YourDayOurTime. All Rights Reserved.